A back-to-school shopping season that has been modest at best shows signs of bleeding into September, with retailers still looking for ways to attract Canadian consumers searching intently for lower prices. If all the back-to-school shopping for clothes, shoes and backpacks isn't done before the start of class today, parents need not fear they've missed the retail boat. In fact, analysts say this current back-to-school shopping season, which has been modest at best, shows signs of bleeding into September, with retailers still aggressively looking for ways to attract Canadian consumers searching intently for lower prices. "It's a bit of a game of chicken between consumers and retailers," says Daniel Baer, retail and consumer products sector leader for consulting giant EY. "I think consumers will tend to hold off and hope for bigger promotions." EY (the consulting firm formerly known as Ernst and Young) was predicting earlier in the summer that spending on traditional back-to-school items such as clothing, shows and stationery this year would be flat compared to 2013. That projection was based particularly on the expectation that higher food and gas prices, inflation and investment in new homes would leave price-conscious Canadian consumers with less money to spend on classroom stuff. That projection of stagnant sales remains on track, says Baer, who also notes that it's a "very competitive" marketplace. Consumers have also been finding their email inboxes filling up with aggressive sales promotions. More limited-time offers have been popping up, including 24-hour flash or one-day sales. 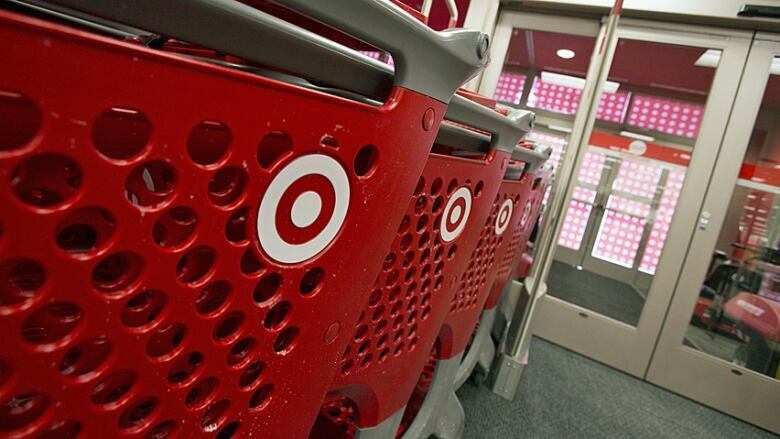 Target has more stores open this year in Canada, offering more competition for back-to-school dollars. (Geoff Robins/Reuters)​"You do have more competition this year certainly from Target, which has its full 130 stores online, versus about 50 or so last year." "A few retailers have used that during the holiday shopping period quite successfully, and we've seen more retailers picking up on that during back-to-school," says Baer. Because consumers are increasingly conscious of their dollars, some may wait to see if items such as books are available second-hand once school has started, Baer suggests. "We do think the traditional period will extend a little bit into September." Other analysts see different factors at play in back-to-school shopping this year, including the weather this summer, which has not exactly been hot and steamy in much of the country. "What we're hearing … is really around this idea that due to the late spring and the compressed summer, with the on-again, off-again weather, it's just delayed the psychology of [consumers] going and saying summer's over, time to get ready for back to school," says Ted Salter, the consulting and deals partner in the retail and consumer sector at PwC Canada. Retailers aren't necessarily expecting — and they certainly won't be hoping — that consumers will spend less. "They just feel it's going to be more compressed," Salter says. "It will probably bleed over into the September timeframe." For parents, that may not necessarily be a bad thing. "We also get caught up in buying supplies before we have a class list, often supplied by teachers these days on the first day of school," says mommy blogger Andrea Traynor, an account director at Hill+Knowlton Strategies in Toronto who posts regularly to her Mommy Gearest blog. As Traynor sees it, the best time to shop is all year, "when you can find what you need on sale." If, for example, you see lined paper for 10 cents a package, that will always get used, whether at school or home. Of course, shopping the sales may not always work for things like clothes and shoes, since kids can take unpredictable growth spurts. "But for backpacks, lunch gear and other school supplies, if you see something on sale that you're pretty sure your kid is going to use, snap it up," suggests Traynor. She also sees no need for going overboard every year and replacing items that might still have some life in them. "Chances are that while lunch bags often need to be replaced annually, a good backpack can last easily two or three years," she says. Another factor that might be slowing down back-to-school spending this year is the amount of debt Canadians are facing compared to their disposable income, says Jean-Yves Ménard, a partner at KPMG in Montreal. Menard has seen forecasts ranging from expectations of a flat market to growth of three to four cent. "So that tells me it's a modest increase … not spectacular, but maybe not flat." Back-to-school shopping is also unlikely to be immune from one of the greatest trends in retail these days: the impact that online browsing and purchasing has had on shopping overall. "Half of Canadians are looking online for products," says Menard. The ease of online shopping may also play into a potential bleeding of the back-to-school season beyond the traditional rush that could happen during the last week of August. While busy parents might be unlikely to go shopping at the mall during the first week of school, Salter says e-commerce makes it a little easier to delay some of that purchasing and still be able to get some of what they need when the kids are back at school.